The Bosom Buddy Holster was designed by women for women. Made of sturdy (yet breathable) moisture wicking polyester, plush elastic, and velcro. It fits flush around your rib cage under your bust line. Providing fast access to your handgun. Not only comfortable for all day wear, but great to wear while exercising. The bosom buddy holster comes with two different bra straps accommodating most bras. The Bosom Buddy Holster is perfect for jogging, hiking, going out, or staying in. Is concealable even under fairly tight fitting tops or dresses (depending on the size of your gun and your bust). Keeping your concealed carry firearm close to your body. The back panel is lightly padded to prevent the trigger guard from digging into your body while sitting or driving. There is a breathable but waterproof layer between the front and back panels, keeping your gun dry even if you perspire. For cup sizes smaller than a D we recommend our Fancy Pants Holster that fits around the hips if you have a gun with a total length of more than 5.75″. Women face unique challenges when it comes to carrying a concealed firearm. Most holsters are made for men, and while they can certainly be worn by women. Women have shorter torsos, wider hips, and a completely different wardrobe. While men may find it easy to conceal a weapon under a loose shirt and baggy pants, women have to deal with form fitting clothing and dresses. Both of which make a concealed weapon more difficult to conceal. The Bosom Buddy Holster is your solution to making your gun easily accessible, while still remaining comfortable! The plush elastic and velcro closure make the Bosom Buddy Holster adjustable if you go up or down in weight. There is a central loop that snaps around the gore of your bra, keeping the holster from riding down. There is an additional loop that secures the gun inside the holster. A small pocket on the side of the holster is perfect for holding your ID, cash, or concealed carry license! 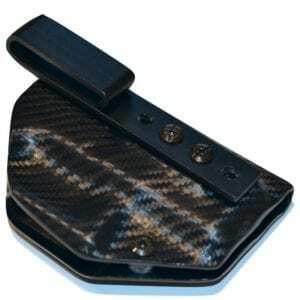 If your looking for something different check out the Fancy Pants Holster. Looking for other holster options for women, visit our women only page. Or for custom designs visit Fancy Pants Holsters and tell them Just Holster It sent you.